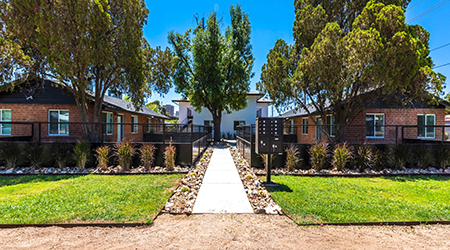 The Phoenix based Vestis Group multifamily brokerage team of Natan Jacobs, Chad Barber and Matt Morrell negotiated the transactions on behalf of the seller, MODE Apartments+Homes from Phoenix, Arizona. The buyer, a private investor from Phoenix, Arizona, did not utilize third party representation. Highland at Midtown, aka MODE @ Highland, is a boutique, 6-unit, one-story, triplex, apartment community located in Midtown Phoenix and Turney at Midtown, aka MODE @ Turney, is a boutique, 8-unit, one and two-story, apartment community both located in Midtown Phoenix, near the Valley Metro Light Rail, the Phoenix Art Museum, the Heard Museum, Arizona Opera, Phoenix Theatre, Lisa Sette Gallery, Margaret T. Hance Park, Park Central Mall, Phoenix Children’s Hospital, Arizona Heart Hospital, and boutiques and popular eateries such as Lux Coffee, Clever Koi, Pane Bianco, Ocotillo, Postino Wine Cafe, Federal Pizza, Joyride Taco House, Windsor, Churn, Lou Malnati’s, Flower Child, AJ’s Fine Foods, and some of our State’s top schools including Xavier College Preparatory and Brophy College Preparatory. The Central Avenue Corridor is less than half a mile from the subject properties and serves as the main connection between Uptown/Midtown and Downtown Phoenix. It is one of Phoenix’ s most vital and heavily trafficked stretches of roadway with nearly 60,000 cars daily. It is also the region’ s largest employment corridor with over 18-million-square-feet of office space accommodating more than 120,000 employees and is home to prominent employers including The City of Phoenix, Wells Fargo, JPMorgan Chase, Freeport McMoRan, Bank of America, and United Healthcare.